When finding your dream home in Los Cabos, Mexico, it’s good to know, what to expect when moving to paradise. It’s a vibrant place attracting people from all over the world. Throughout the year, there are events, celebrations, and occasions catering both to visitors and locals alike. The weather never really goes too bad, however, certain times of the year are better for particular activities. Windermere Los Cabos has prepared for you this summary of the month to month highlights of living in Los Cabos. January is high season in Los Cabos. With gentle warm weather (on average 66°F) it attracts tourists and holidaymakers. It is the perfect time to head out whale watching as the season runs from December to April. The mild temperatures also make it a good time to go and explore the outdoors and head inland. A noteworthy national celebration in January is the Dia de Los Reyes Magos (January 6) during which you might find Rosca de Reyes traditional pastries being baked. This day signifies the day the Three Wise Men gave gifts to Jesus Christ. The shortest month of the year might be dull and forgettable elsewhere, but it’s as glorious as any other in Los Cabos. For nature lovers, whale watching goes on at full speed. Art lovers can witness Todos Santos Open Studios, which is an annual event going strong for nine years already. Visitors are welcomed to visit artists in their studios and witness the creative process first hand. If you’re up for a challenge, Los Cabos Half Marathon cannot be missed. During February, the weather isn’t very much different than in January. Mild temperatures averaging 68°F allow you to enjoy everything Cabo has on offer. Many festivities and celebrations take place in Los Cabos during March – you just have to take a pick. Days are getting longer and the weather – warmer. The second week of March is when the festival of San Jose del Cabo takes place. During this time, parades and festivities honour St. Joseph, the patron saint of San Jose del Cabo. Expect music and carnivals, great food and a good time. On March 21 it’s also a national celebration and commemoration of the country’s first president Benito Juarez. April is the last chance before December to go whale watching as the season runs only until April 15. April is the last month of the so-called high season, and you can expect to see a lot of party crowds during Spring Break. While you might expect to see a lot of Cinco de Mayo celebrations, that’s not exactly the case in Los Cabos. Many emphasize that Cinco de Mayo in terms of celebration means more to Americans than to locals in Los Cabos. May is a good time to be in Cabo as it is between two high season periods. You can expect fewer crowds and great discounts on a lot of things. Those into surfing will enjoy the Surf Summit taking place mid-May. Even though Cabo doesn’t get a lot of rainfall altogether, on average May is one of the driest months and the temperature averages around 79°F. June is the last month to enjoy fairly milder warm temperatures before the hot weather hits. It’s important to remember sunscreen wherever you go as June is pretty much cloud-free. The surfing conditions are good during June and it’s a good time to hit the waters. Los Cabos Open of Surf takes place mid-June. Not only can you witness top surfing athletes, but there’s also concerts and other events. A month of warmest waters and generally great weather. A good time to hit the waves both in the Sea of Cortez and the Pacific Ocean. The tourism season is not at its peak due to hot temperatures and slightly increased chances of rain. However, Los Cabos, in general, gets very little rain so the talk of the rainy season is slightly exaggerated. August is among the hottest months in Los Cabos with temperatures ranging from 88°F up to 99°F degrees. During this time you’ll see fewer tourists and it’s not the best time for outdoor activities like heading inland as the temperatures are just too high. Many family attractions and activities are closed during the more quiet months so a day at the beach is the best option for families since the water temperatures are the warmest and nicest. Los Cabos Open men’s tennis tournament happens in August and there are a few fishing tournaments happening too. Mexican Independence Day takes place on September 15 and even though September is more of a quiet month in Los Cabos, you can expect great festivities on this day. While both air and water temperatures remain high, September is excellent for being near the sea. It can be especially appealing to those, who like fishing since there’s a great variety of marlin in the waters during the month of September. If you feel especially passionate about nature, you can join a conservation group helping rescue sea turtles as many of them nest near beach resorts. The dates usually vary between September and October. Before the peak tourist season picks up around December, October and November is the best time to enjoy much kinder temperatures than in the summer months. There are plenty of fishing tournaments happening in October, such as the worldwide recognized Bisbee’s Black and Blue Tournaments, which have been taking place in Los Cabos for over 30 years. It’s also a good time to go snorkeling as whale sharks arrive at the area. On October 18 the Fiesta de Cabo San Lucas takes place celebrating the patron saint of Cabo San Lucas and you can expect to see a parade. November is the last month before the peak season takes off. A good time to head into the water to fish or snorkel. Mid-November is when the humpback whale season takes off and if you’re lucky, you can spot one of these majestic beauties. The temperatures are getting to a more tolerable level and the humidity also drops. The beginning of November marks Día de Los Muertos or the Day of the Dead which commemorates deceased family members and friends. Expect to find the traditional “Pan de Muerto” in bakeries and supermarkets all over town. Last month of the year is the buzzing start to the peak tourism season in Los Cabos. The temperatures have gone back down to a nice and relatively mild level, which makes December perfect for outdoor exploration. The whale watching season also takes off mid-December and lasts until mid-April. There are a few Catholic celebrations happening during December but the majority of festive events happen around Christmas time and especially the New Year’s. In Windermere Los Cabos, we are fascinated with the Mexican traditions we are now sharing with the locals, and this holiday is a special one. 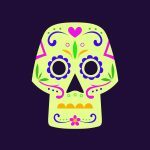 The “Día de los Muertos” translated as Day of the Dead, celebrated in Mexico every year in November 2nd, is a tradition that honors the loved ones that have parted and pretends to make peace with the eventuality of death. There is historic data that shows this celebration was created around 2,500 and 3,000 years ago. Led by the goddess Mictecacihuatl, also known as “Mictlan’s queen” or “Lady of the Dead,” when the celebration lasted a month. But in the XV century, the Spanish arrived and converted natives to the Roman Catholicism. This religion celebrates the “All saints” and “All souls” days in November 1st and 2nd. The natives then adopted these days as their new holidays, combining their ancient traditions with the new roman Catholicism. 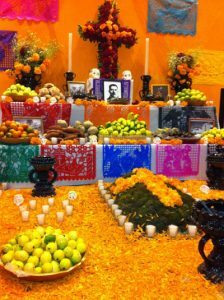 The result is a colorful, sentimental, cultural and powerful tradition to celebrate the souls of the dead. The symbols, the family values, and the respect for their loved ones all in one amazing experience. A picture: This is one of the main elements of the altar. It is a picture of the loved one that has parted and the family is now honoring. Flowers: The representative orange flowers usually used are called cempasúchil, or Mexican marigold. They are set as a path and represent the bridge between the underworld and the altar. It is also very common to decorate the altar with other flowers, mainly if the loved one the family is honoring liked one type in particular. Chiseled paper: Also known as papel picado, is one of the most representative and colorful ornaments in the altar. For some people it represents the element of air. Food: Food, that the loved one used to enjoy, is also placed in the altar. It is very common to see the altars filled with tamales, local candies such as sugar skulls, fruit, coffee, atole and other meals depending on the region. The family believes that the loved one will take this food and enjoy it like he/she used to do. Personal objects: The family may also choose to include personal objects of their loved one, like clothes, toys, or tools, to decorate the altar. This is believed to make the soul of the loved one feel more comfortable while visiting. Candles: They are used as a symbol of guidance, but also as a symbol of hope. They are believed to show the souls their way to the altar and back. Spiritual elements: As Catholicism is now a big influence in these altars, it is common to find some elements like crucifixes and/or images of the Virgin Mary. Overall every altar is created with dedication, respect and love to the soul of the loved one. But for Mexicans, the Day of the Dead is not only about creating an altar or eating pan de muerto; it’s also about visiting their loved ones in the graveyard. Many families take this day off to visit their graves, remember the good moments they shared and pray for their souls. Interested in visiting an altar in Los Cabos? For 3 years, Flora Farms has been connecting local businesses with local charities through this tradition. The 3rd Annual Day of the Dead Altar Competition will exhibit 13 altars, from October 31st to November 6th, as a fundraiser for 13 different non-profits. In October 31st they will host the presentation of the altars in a lovely event with live music, entertainment, and appetizers.